West Penn Wire 16/2 Fire alarm cable features 0.007-Inch polypropylene insulation in black/red color, that protects against electrical threats. This bare copper cable has yellow, 0.017-Inch thick PVC jacket to provide resistance against moisture, heat and sunlight. 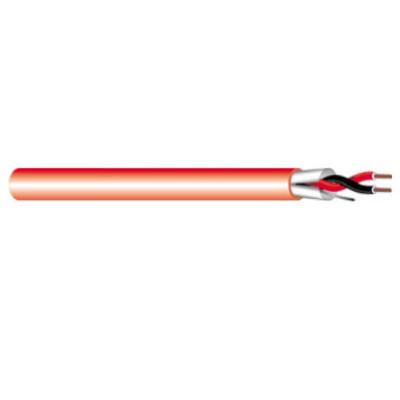 This 0.168-Inch OD cable has voltage rating of 300-Volts. It offers resistance of 4.1-Ohm and capacitance of 23 pF/ft at 1-Kilo-Hz. This bare copper cable has bend radius of 1.75-inches. It withstands temperature of -20 to 60 deg C. It is perfect for fire alarm, audio circuits, control circuits, initiating circuits and notification circuits. Fire alarm cable is UL listed, FPLP certified and RoHS compliant.